Leading jockey Rodrigo Vallejo and Luis Vivanco. (Houston, Texas - Wednesday, May 18, 2016) - The 2016 Sam Houston Race Park Quarter Horse Meet concluded on Monday, May 16 with 14 races. Hez Primed an Ready, a six-year-old son of Prime Talent owned by Crown Racing of Hilltop Lakes, Texas, was named 2016 Horse of the Meet. Trained by Judd Kearl, Hez Primed an Ready was undefeated in his first three 870-yard races this meet under jockey Noe Villatoro. He made his fourth start on the final day of the meet, won from the far outside post, but was disqualified by the stewards. Bred by Larry Haigood, he has been with Noah Powell of Crown Racing for the past two years. The 79-year-old former jockey is passionate about Quarter Horse racing and loved to come to Sam Houston to watch his horse compete. "He had a great meet and would have been four for four," said Powell. "We are very proud of him. All the credit goes to the horse, his trainer and rider." Powell appreciated the excellent care his horse has received from Kearl. "Judd takes his time with his horses and gets them in peak condition," added Powell. "In my opinion, he is the best trainer in the country!" "We congratulate Mr. Powell and Kearl Racing for the accomplishments of Hez Primed an Ready," said Fred Hutton, Sam Houston Race Park racing secretary. "This is a very nice Texas-bred who came up the ranks with flying colors this meet." Sam Houston Race Park officials noted increases in handle for the 24-day Quarter Horse meet, which began on March 25. Despite two race day cancelations due to severe weather, total average daily handle was up 18%, with an increase of daily export handle up 23%. The move from Thursday to Monday afternoons was also positive. "We are very pleased to once again have a very successful racing season," said Sam Houston Race Park President, Andrea Young. "Monday afternoon racing was well-received by our fan base, resulting in an increase in daily average handle of 38%." Hez Primed an Ready was just one of 37 winners trained by Judd Kearl throughout the 2016 Sam Houston Race Park Quarter Horse meet. Kearl, 41, grew up in Tremonton, Utah and got his start in Idaho, Utah and Wyoming. He made his move to Texas in 2004 and resides in Spring, just ten minutes away from Sam Houston Race Park. He operates a farm and training center in New Waverly, Texas. His first leading trainer title at Sam Houston Race Park came in 2006. With his seventh score, he tied the late Steve VanBebber, who dominated from 1994-2000. Kearl's stakes wins this meet included Jessies First Down, who won the $50,000 Sam Houston Classic; Moe Lassus in the $30,597 Bank of America Texas Maiden Challenge; BM Casino Royale in the $44,640 Adequan Texas Derby Challenge; and Kitty Kat Galore B, winner of the $15,000 Miss Houston Stakes. The year is going superbly for the Texas-based horseman, who is the #1 Quarter Horse trainer in the AQHA standings with 73 wins and $1.2 million in purses. He is ranked 38th on the list of all-time trainers by money earned. "We've had a great meet. I can't thank my help enough. Jimmy's done a really good job since he's moved down here and joined us. My owners and riders, Rodrigo (Vallejo) and Noe (Villatoro). Noe is a good rider and super hard worker. He came on with us last year in Florida. He's got a bright future." He also reflected on Ted Abrams, Sr.'s homebred Jessies First Down. "Jessies First Down is a super horse," he added. "We've run second in the Bank of America Texas Challenge two years in a row. We'll stick around and get it done next year." Angel Sanchez, who topped the standings in 2014 and 2015, finished second with 21 wins. He won the richest race of the meet, the $540,000 Sam Houston Futurity, with Just Call Me Carter. Leon Bard was third with 15 wins, Patrick Clemons saddled 13 winners, and Brian Stroud rounded out the top five conditioners with 11 wins. The battle for leading rider went to the wire, with Luis Vivanco and Rodrigo Vallejo finishing in a tie with 32 wins each. Both jockeys had won the Sam Houston Race Park title three times each. 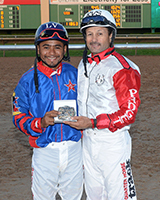 Vivanco had success for a number of horsemen throughout the racing season, including Angel Sanchez, Brian Stroud and Patrick Clemons. The 33-year-old jockey was born in Vera Cruz, Mexico and rode 185 horses season here, finishing with 32 wins, 39 seconds and 29 thirds. This is the second title in 2016 for Vallejo, a native of Jalisco, Mexico, who rides first call for Judd Kearl. With his success earlier this year at Hialeah Park, the 50-year-old rider is currently the #1 ranked AQHA Quarter Horse jockey in the nation in wins, and second in money earned for the year. Francisco Calderon was third with 25 winners. Luciano Duenez followed with 12 victories, and Noe Villatoro rounded out the top five with 11 trips to the winner's circle. For the third year in a row, Pete Scarmardo topped the owner standings at Sam Houston Race Park. The Caldwell, Texas cattleman has been involved in Quarter Horse racing and breeding for decades. He won nine races this meet, highlighted by the $98,300 Sam Houston Maiden Classic with Kid Can Dash and a victory with another homebred, Time For Wine, in the $26,100 Merial Texas Distaff Challenge. "I'd like to thank my trainers, Leon Bard and Brian Stroud, for doing such a good job with my horses, and the jockeys as well," said Scarmardo on the final day of the meet. "I'm just glad to run in Texas. There's not as much money here as other places, but Texas is home. Staying here and running some of my better horses in Texas is important to me." Scarmardo will send his horses to Retama Park for its meet, which begins on June 10. He also has a few of his horses headed to Ruidoso Downs. Jorge Haddad won five races to finish second in the owner standings. John Boegner, Esmeralda Peck, Bobby W. Myers and Crown Racing tied for third with four victories. Sam Houston Race Park will remain open seven days a week offering a comprehensive menu of simulcast racing. Next up is the simulcast the second leg of racing's Triple Crown, the Preakness Stakes on Saturday, May 21. Popular race meets including Monmouth Park, Saratoga and Del Mar will showcase top Thoroughbreds this summer, and Quarter Horse fans will be able to watch and wager on "America's fastest athletes" at Ruidoso Downs beginning May 20.